Today we’re gonna get crazy about meatless meatballs. Or as Ken said about them, “those aren’t really meatballs.” My response was that they are a great meatball-like alternative meatball for those who don’t eat meat. Farro, chickpeas and oats form the base of these vegan meatballs and flax egg holds them together. Flax egg equals 1 tbsp of ground flax seed mixed with 3 tbsp of warm water. 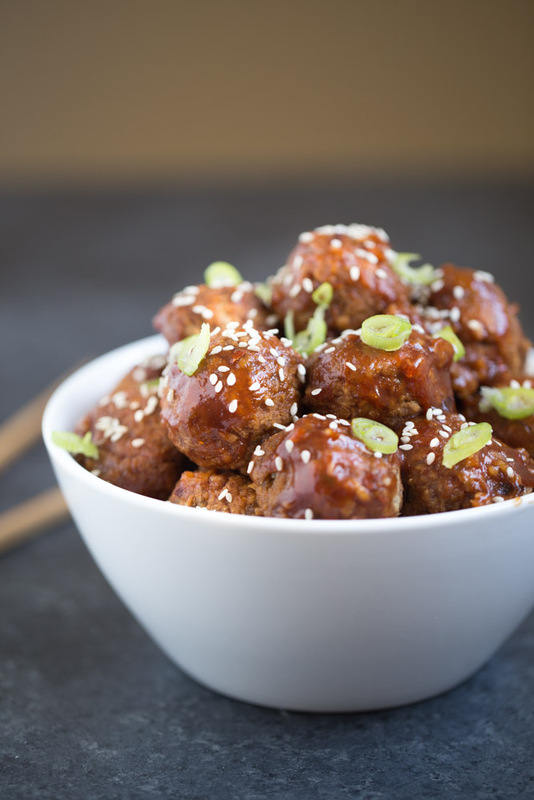 Some Asian style seasonings such as Chinese 5 spice and sesame oil season the vegan meatballs. 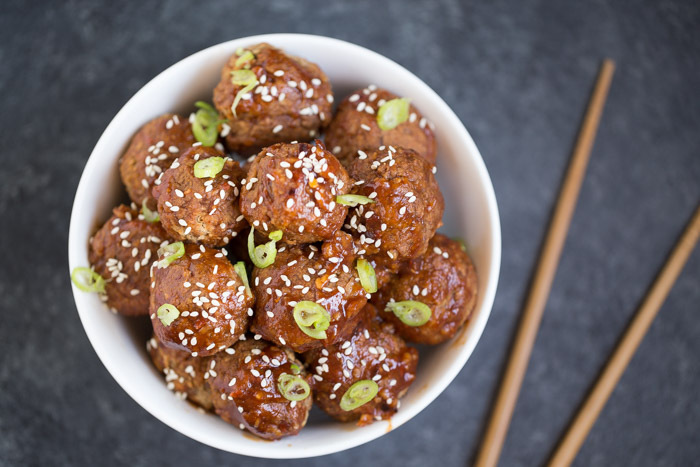 A toss of the meatballs in a spicy sauce made with ketchup, mirin, tamari and sriracha finish these meatballs off nicely. You can enjoy these vegan meatballs solo (a great appetizer) or over rice for a nice main course. Lunch or dinner, they’ll work either way. they’re made with ingredients that are typically stocked in any pantry, which means no trip to the store in order to make them. they’re great as an appetizer or served over rice for a main dish. Preheat oven to 400. Line a baking sheet with aluminum foil. Spray lightly with cooking spray. Wipe away excess spray with a paper towel. Place all meatball items in a food processor or blender. Been until just combined. It's okay to have full pieces of farro. It gives the meatballs texture. Roll into 1 tbsp balls and place on the baking sheet. Bake for 20-25 minutes. Makes the sauce. In a mixing bowl, whisk together sauce ingredients. Dip each meatball into the sauce to coat. Alternatively, you could place the meatballs in a bowl with the sauce and carefully toss to coat. Sauce and vegan meatball seasoning loosely adapted from this meatball recipe by Gimme Some Oven. You are so clever to come up with this recipe from scratch and it is vegan! They look great! Happy Birthday. These are the kind of meatless meatballs that I actually WANT to eat. And, I can’t lie, I’m a HYOOGE meat eater, so that is saying’ SOMETHING! I am addicted to Asian flavor, so these are BOMB! Pinned! Haha, I used to be a huge meat eater too but now I’m only eating seafood. But I will admit, in the four months since I ate chicken, I have dreamt about it many times. And sometimes I really REALLY crave a cheeseburger. :) Thanks Taylor! Hope you and your family enjoy them, Rachel! What an awesome looking vegan meatballs. Loved that you shared this fabulous recipe on a weekday. Would give it a try soon! Delicious, Julie and I love how they don’t fall apart! A triumph! Happy Birthday my dear… I’m thinking 34? Maybe 25? First time here and I just love your space… ! I’m so happy you enjoyed your visit. Have a lovely day! I’m with Traci – happy early 25th birthday!! These vegan meatballs look great!! Their shape holds up so well, too! LOL, well thank you, Lisa! I may have heard that line 9 years ago. 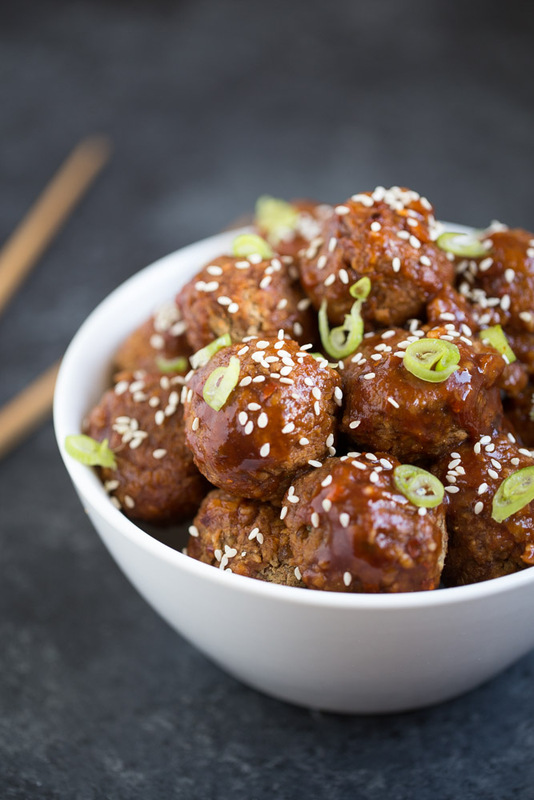 ;) I really like that these vegan meatballs don’t fall apart and that they hold their shape! they look incredible! I never would have guessed they were vegan. and Happy Birthday!! They do look like real meatballs and I’m sure they taste delicious! Love everything you used in the recipe! Cab’t wait to try them! LOVE these! I haven’t had meatballs since cutting meat out over 9 years ago!!! this is a great recipe ;-) I totally need to try these! Yum! Meatballs are my favorite! Love that you made them vegan! Genius! This looks so delicious! I cannot wait t try making it. These look delicious and such a great alternative for those that don’t eat meat! Thanks so much for sharing at Share The Wealth Sunday! 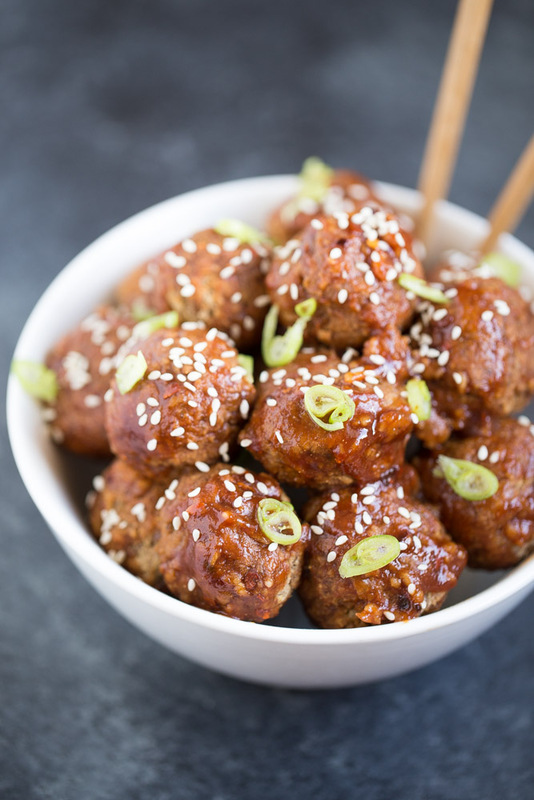 Hands down the best Asian meatballs I have seen! Aww thank you so much, Thalia! OMG !! What a wonderful recipe! It’s all about the spice!! Thanks for joining us on Oh My Heartsie Girl Wordless Wednesday! I would love to try these. They sound and look awesome. What can I use in place of the mirin? You could replace the mirin with rice vinegar or even dry sherry. Hope this helps and I hope you enjoy the recipe! Thank you for your concern but there isn’t egg in this recipe. The recipe calls for “flax egg” which is a binder made out of ground flax seed, not egg. I’m so sorryfor the useless coment, but thank you for teaching me something new i didn’t knew about it thanks for explaining by the way the recipe is wonderful. My family is vegetarian but I haven’t got around to making vegan meatballs or anything like that yet. These look so good! These meatballs look so good! I would never guess they were vegan just by looking at them.? I recently tried soy meat and I’ve been trying to cut down on the amount of meat I eat. I’m going to try out your meatballs on my next meatless dinner night!? Just a reminder, don’t forget to add links to this week’s Fiesta Friday post, as well as Petra’s blog and my blog so you can be considered for features next week!? Thanks for sharing! Happy Fiesta Friday!!? I love trying Asian inspired recipes at home. This looks amazing. Thanks for sharing at the Inspiration Spotlight Party. Pinned & shared. These look like the real deal and I’m sure they taste great too! Thanks for sharing with Funtastic Friday!